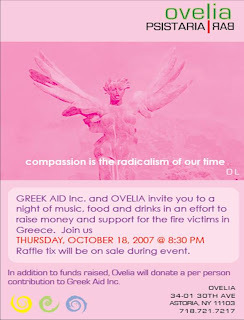 OVELIA is graciously hosting a GREEK AID dinner this Thursday evening to benefit the organization raising money for the fire victims in Greece. The restaurant is also donating to the organization for every person attending the dinner so please make sure to have an appetite for Greek food this Thursday. You get a delish meal. GREEK AID gets money from OVELIA. Money goes to important cause. OVELIA is located in Astoria, NY on the corner of 30th Avenue and 34th Street.